PHILADELPHIA, PA – November 2, 2017 – State Sen. Christine M. Tartaglione, Gov. Tom Wolf, Mayor Jim Kenney and legislators from throughout Philadelphia yesterday celebrated the enactment of new legislation that will help local and state authorities curb nuisance shops that sell alcohol. 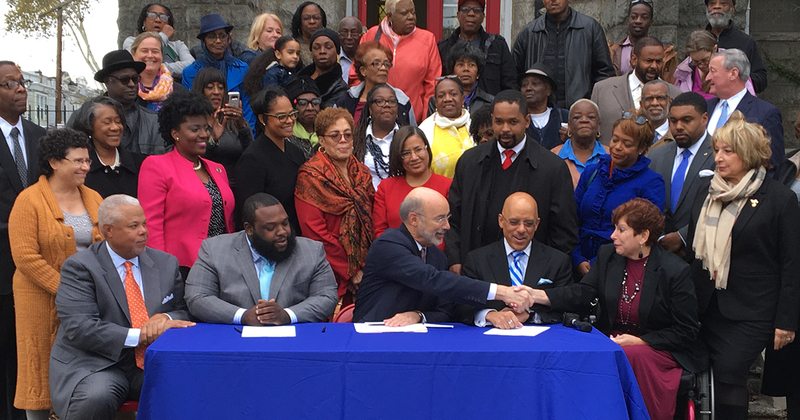 The governor hosted a ceremonial bill signing at Devereaux United Methodist Church in the city’s Allegheny West neighborhood, a community where residents have long complained about the negative impact of so-called “stop-and-go” stores. Stop-and-gos are small convenience stores, delis or gas stations that hold liquor licenses and sell alcoholic beverages by the bottle or can. Many also sell hard liquor by the shot. Their licenses require that they offer prepared food, seating and restrooms for patrons, but many do not. Many of the businesses attract or provoke loitering, public drinking, underage drinking and more serious crimes. Typically, their liquor licenses are subject to biannual renewal. Often, a business will appear compliant during the renewal process but deteriorate into non-compliance shortly thereafter. The new provisions added to Pennsylvania’s Fiscal Code will allow state liquor enforcers to act immediately on complaints from local authorities, such as police. Those complaints would trigger prompt inspections that could result in the administrative suspension of a non-compliant business’ liquor license by the Pennsylvania Liquor Control Board. The license would remain suspended until the business complies with the liquor code. The new administrative process also includes provisions for follow-up inspections to ensure that the business remains compliant. “This new set of regulations will be a valuable enforcement tool allowing local authorities and the LCB to respond promptly to valid community complaints,” Tartaglione said. Cities and towns in other parts of Pennsylvania experience similar problems, the governor explained. During her public comments, Senator Tartaglione noted that many state lawmakers have been trying for decades to forward legislation that would rein in stop-and-gos. A recent bill in the Senate was on the verge of being referred into committee where additional language related to liquor privatization may have been tacked onto the anti-nuisance measure, Senator Tartaglione said. Instead, the bill’s supporters were able to include the anti-nuisance language within the broader Fiscal Code legislation. The new code takes effect immediately.